Posted 13 February 2018 under Ask Us. 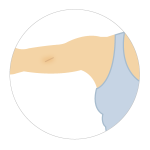 Nexplanon (a type of birth control that is implanted under the skin of a women’s upper arm and lasts for at least 3 years) is very effective in preventing unplanned pregnancy but it often causes a change in your normal menstrual bleeding pattern. Your period may be longer or shorter or you may not have your period or just spotting. Because your period is painful and heavy for the past two months, you should call your health care provider to get your blood count checked and to see if there is another cause for bleeding such as a sexually transmitted infection and to discuss if you need any treatments.